If you have Hedgehogs visit your garden then you are very lucky as they help control many of the pests that may attack your plants and the GSPCA are asking for you to help ensure you garden is Hedgehog friendly. To attract Hedgehogs to your garden you can try providing hedgehog homes, both natural man-made such as placing a piece of board against a pile of bricks to form a type of bivouac. Alternatively if you pop to the Animal Shelter we have a selection on sale which are purpose built. One way to do this is to leave a Hedgehog friendly area of garden, leaving welcome heaps of leaves and brushwood. 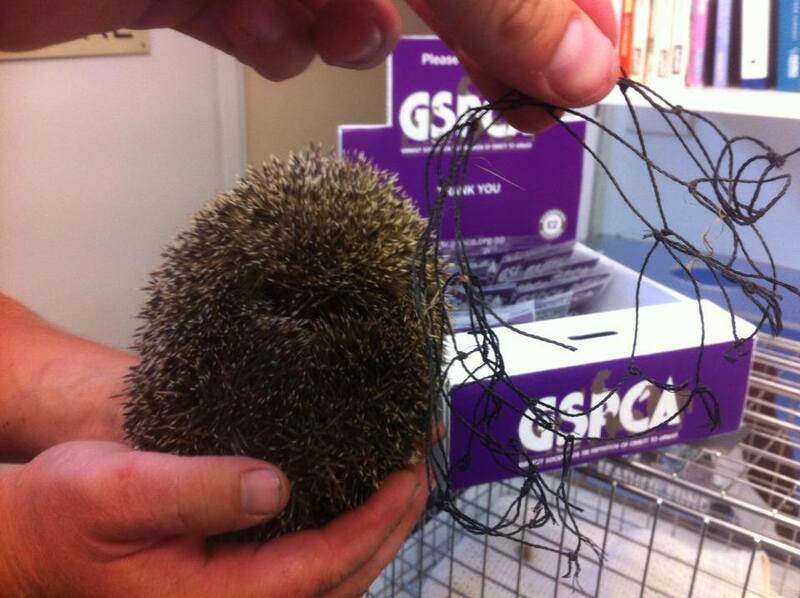 The GSPCA sell a selection of Hedgehog food which is designed specifically for them. Food and fresh water at any time of the year will encourage visiting Hedgehogs to return regularly. You could try leaving out food such as minced meat, fresh liver, tinned dog food (not fish-based), or chopped boiled eggs. Although Hedgehogs like milk it can cause severe diarrhoea; the GSPCA ask that you never give them cow’s milk. It is best to give Hedgehogs plain, fresh water each night in a shallow bowl. Also it is important that you do not feed them bread as this is not a natural or healthy diet for them. During hot weather a bowl of fresh water can really help as well as the tinned food as this also is full of moisture. If you are putting out a biscuit diet for Hedgehogs then a bowl of water is a really good idea. There are lots of things you can do to protect and care for Hedgehogs in your garden, to prevent them from becoming sick or injured. Garden ponds and swimming pools - Make sure there is always an easy route for Hedgehogs to climb out of the water. Steps built out of house bricks are often used. Ideally, swimming pools should have shallow steps and a tight-fitting insulating cover should be used overnight. Strimmers and hedge trimmers - These should be used sparingly under hedges and other areas of undergrowth. Hedgehogs and other animals are likely to be resting there during the day. The GSPCA see animals injured by these every month and if this does happen please contact us immediately or pop them to the Shelter as quickly as possible. Drains - Drains and similar open holes frequently trap unwary Hedgehogs and they can starve if they are not rescued. Keep all drain covers in good condition and cover any open holes. Litter - Litter is a real hazard and Hedgehogs frequently get their heads stuck in tins, plastic binders from drinks cans or discarded yoghurt pots. Please make sure you dispose of your rubbish safely. Also please ensure that you store any items for recycling in a safe place away from inquisitive Hedgehogs. Nets - Nets particularly those used for tennis, football or cricket, must be furled well above the ground when not in use. Hedgehogs often get entangled in these nets and die of starvation. Fruit nets are a similar source of danger but can be kept taut to stop animals getting entangled. Pets – Dogs are often quite inquisitive when they see a Hedgehog in the garden. It is important that your dog doesn’t try to play or pick up a Hedgehog as it can both injure the hedgehog and your pet. Slug pellets - Slug pellets can poison Hedgehogs and should only be used as a last resort. Try using other methods such as beer traps or sprinkling fine sand or ground up shells around the plants you need to protect; rings made of cut down plastic drinks bottles can offer protection to individual plants and aluminium, sulphate-based products can be used over wider areas. If all else fails and you have to use pellets, place them under a slate which is inaccessible to Hedgehogs. Rodenticides – There is new evidence that has shown that Hedgehogs are at risk from poisons put down for rats and mice. Although the bait boxes used should not allow Hedgehogs to get to the bait, slugs and snails are attracted to the bait and will then store the poison in their bodies, so when the Hedgehog eats the slug, they get the poison. So always seriously consider whether you need to use these chemicals and if so, please be very careful. Bonfires - If you have to light a bonfire, always make sure there are no animals sheltering in the pile. They have relatively long legs - about 10cms (4") and these enable them to run as fast as we can walk. Their weight will be largely determined by the food they get, but most one-year olds will weigh between 450-680gms (1-1½1bs). Self-anointing is an activity only Hedgehogs do. It seems to be connected with strange smells or tastes that cause them to produce large quantities of frothy saliva. They then spread the foam over their spines by flicking it with their tongue. Hedgehogs do not pair bond - the female raises her young unaided by the male. 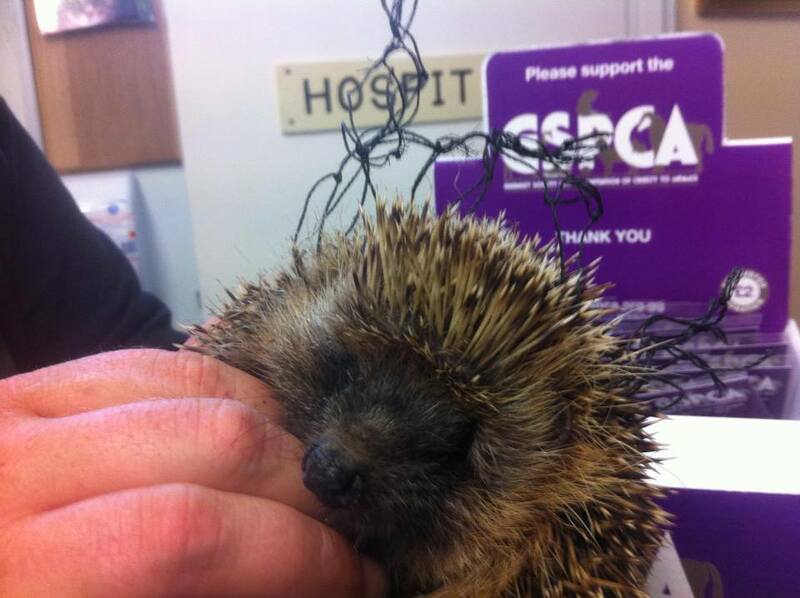 At the GSPCA we saw more sick and injured Hedgehogs than any other species of wild animal. 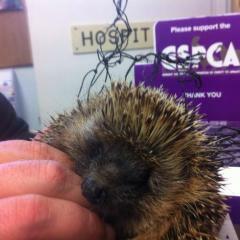 The GSPCA when we release Hedgehogs ensure they are painted purple with plastic coded tags attached to their spines and to ensure we can identify them if they return in years to come we now also microchip them. If you want to help our Hedgehogs then why not Sponsor the Hedgehog Unit. To find out more please click here.